The cost of buying land to build a new house in Melbourne’s outer suburbs surged 12.4 per cent last year to accompany a double-digit rise in existing house prices, according to figures compiled by project marketers red23. Melbourne house prices surged 15 per cent, according to CoreLogic and more than 10 per cent, according to Fairfax-owned Domain. 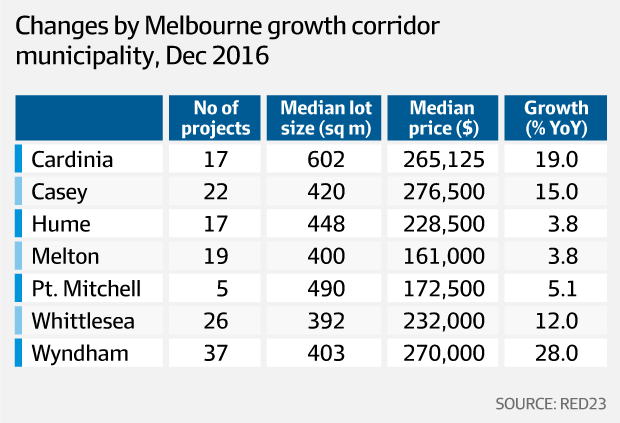 Across the 143 active housing projects tracked by red23, the Melbourne median lot price rose to just under $240,000, though buyers were compensated with slightly bigger blocks of land, with the median lot size rising from 420 to 448 square metres. Despite the rising cost of land, a Melbourne lot still remains 40 per cent cheaper on average than a Sydney lot. The October HIA-CoreLogic Residential Land Report recorded a Sydney median lot price of $420,000 for a 450 sq m block. Factoring in the cost of building, a new three-bedroom home within 25 kilometres of the Melbourne CBD can still be bought for under $350,000. In Sydney’s outer west, a new three-bedroom home will cost around $600,000. According to red23, lot price growth was strongest in Wyndham in the south-west, home to the more established growth suburbs like Point Cook and Williams Landing, where lot prices soared 28 per cent to $270,000 and weakest at just 3.8 per cent in Hume in the north and Melton in the west. Explaining the surge in land prices Red23’s head of research Andrew Perkins said: “In 2016, we saw interest rates at an all‐time low, the strongest auction clearance rates since 2009, continued strong population growth, affordability relatively sound in comparison to Sydney and confidence levels stable. “This suggests that all things being equal, 2017 will be much the same [for price growth],” he added. Strong buyer demand was also a key factor in rising lot prices, with the Victorian Planning Authority reporting a record 22,000 lot sales in the year to September – Melbourne is home to the country’s fastest selling housing estate, the 7000-lot Woodlea estate at Rockbank in the west being developed by Mirvac and VIP Properties. The strong rise in lot prices and record demand for new housing has seen developers pay huge sums of money for land in the outer suburbs. Recently, Stockland paid between $150 million-$200 million for a 114-hectare portion of the Baillieu family’s Minta Farm in the south-east while Chinese real estate giant Dahua Group paid more than $350 million for three sites in Wyndham. Melton remained the most affordable new housing market in Melbourne with a median lot price of $161,000 for a 400 sq m block. Casey in the south-east, home to projects like Circa 1886 by BRW rich lister Neville Pask, has the most expensive median lot price at $277,000.